2017年10月22日(日)、関西大学１００周年記念ホールにて大阪日米協会ユースサポート 委員会の企画による「日本文化まるごと体験DAY」を関西大学様と共催にて開催しました。 当日は、台風の影響もあり午前中までの開催となりましたが、２０ヶ国以上６８名の留学生の 皆様に12の日本文化を体験していただきました。ワークショップでは、日本の文化として 人気のある「書道」「華道」「茶道」をはじめ「着付け」や武家の礼法である「小笠原流礼法」、 「とんぼ玉」「けん玉」「折り紙」「ちぎり絵」「殺陣」「和菓子」等を体験していただきました。 また、ステージでは日本の伝統的な楽器和太鼓の迫力ある演奏も行われました。 ボランティアでご協力をいただきました専門家の皆様のお蔭で、普段ではなかなか体験 することが出来ない事ができ、短い時間ではありましたが楽しい時間となりました。 なお、今回のイベントは、平成２９年度公益財団法人中嶋記念国際交流財団助成による 留学生地域交流事業助成金をうけて実施されました。 Japanese Culture Workshop Day Sunday,October 22th, 2017 The JASO cultural exchange program – “Japanese Culture Workshop Day” – was produced by the Youth Support Committee of JASO and Kansai University, and held at the Kansai University Centenary Memorial Hall on October 22th, 2017. On that day, there were already several groups of exchange students and other people lined up outside the doors well before the 10:00am start. In total, over 68 participants from over 20 countries came out to experience 12 different demonstrations of Japanese culture. Everyone really enjoyed not only “Shodo” (calligraphy) and “Ikebana” (flower arrangement), aspects of　Japanese culture well-known all over the world, but also “Ogasawara-ryu School of Etiquette” for Shogun and Samurai warriors and “Sado (tea ceremony)” while wearing a Yukata. 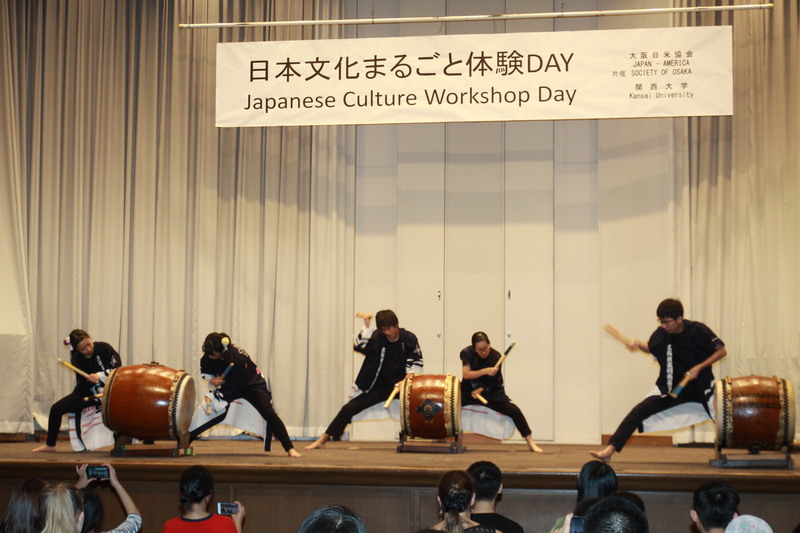 Also, there was powerful performance of Japanese Drums on the stage. 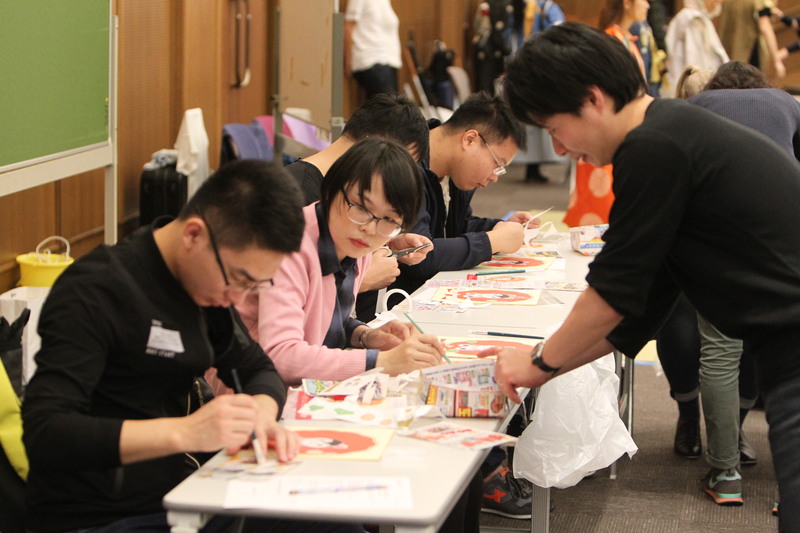 All the participants who joined this event, including the volunteer staff, had a wonderful time together. This event was a great way for students and interns to experience various aspects of Japanese culture under the free guidance of experts. This was subsidized by the Nakajima Foundation and supported by JASO. 当日の様子はフォトギャラリーに掲載しています。 Please find photos in the Photo Gallery.